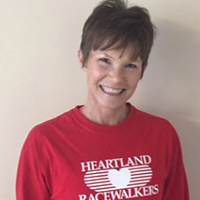 President Karen Swisher began racewalking in 2015 to become more fit. 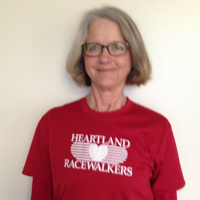 She finds the physical and mental challenges of racewalking fun, especially given the inspiring, supportive group of people in Heartland Racewalkers. 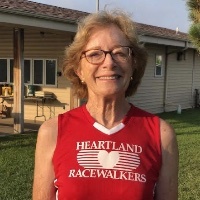 She was selected as the USATF National Masters Racewalker of the Year in 2017 (65-69), in conjunction to Indoors Masters and Outdoors Masters events. In 2017 she acheived 2nd nationally across all female age groups in the age-graded performance in the USATF Grand Prix. Treasurer Tom Oakes is starting his tenth year as Treasurer and enjoys staying in shape by attending group walks. Secretary and Clinic Director Sunday Cavallaro joined Heartland Racewalkers in 2012 to learn the technique and to be surrounded by a supportive group of like-minded fun people. 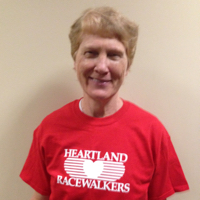 She enjoys racewalking both competitively and recreationally. Fitness wise, she also enjoys strength training and the outdoors. She has previously been a group fitness and Zumba instructor. Photographer Maggie McCoy was drawn to HRW because she liked the idea of a sport that would be kind to one's joints. Coming to the HRW meetings has been even more wonderful because of the accomplished, interesting, supportive people in the group. She hopes to develop her skills to the point where she can compete. 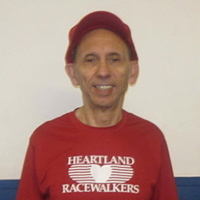 Past President Alan Poisner, a founding member of HRW, began racewalking in 1985. After serving for 20 year as President of HRW, he has continued to support racewalking locally and beyond. He loves to compete, coach and support racewalking. He has won many Gold Medals and set records at National Senior Games, USATF National Meets and the 2011 and 2017 World Masters Athletics Championships. He was selected as the USATF National Masters Racewalker of the Year in 2011 (65-79), 2015 (80-84), and 2017 (80-84). In 2017 Alan achieved 4th nationally in the USATF Grand Prix for male racewalkers of all ages based on age-graded performance. Fred Adams got into racewalking in 1989 due to a health problem. He saw the Senior Olympic Racewalkers and decided he'd like to try that. It provided him a workout and he enjoyed it. He has enjoyed the people he has met over the years and likes the competition. 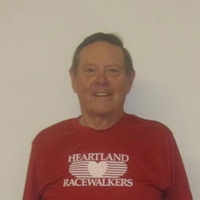 Pat Durkin started Race Walking in 2013. After many years of running, her knees and lower back needed a break. She enjoys the technique of racewalking, competition and the club activities with a great group of people. 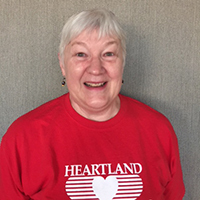 Maggie Link found Heartland Racewalkers by looking it up online. I really have enjoyed learning this new skill and trying to get better at it. It's a lot of fun and this group is filled with positive people.